This is a beautiful set of sterling silver and yellow gold bracelets. These bracelets all have a deep rich hammer blow that catches the light nicely. The thin cuffs have a graceful curve and the thick ones are a straight style. They can be worn with the curves all flowing together, or intermingled. This set can be added to any other set, worn as shown, or worn individually. 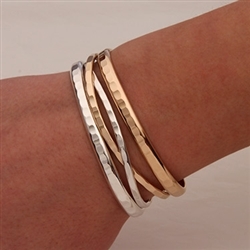 The options are endless with these beautiful cuff bracelets.